Play video Why is Med so deadly for migrants?Why is Med so deadly for migrants? Play video Why is Med so deadly for migrants? This brings to an end our live coverage of the disaster in the Mediterranean, where a huge rescue operation is continuing into the night after a boat carrying hundreds of migrants capsized. Italian officials say 28 people have been rescued and 24 bodies have been recovered, amid fears that hundreds of others have drowned. on the BBC News website. More from Italian PM Matteo Renzi's news conference. He says: "What we're asking for is not to be left alone. Not just in this emergency at sea, because in these situations the sea is always a horrible beast. "This is a political issue, with a capital 'P'. It's an issue of human dignity, rather than of national security, to block this trade in human beings." tweets: "#Malta to take around 30 bodies recovered so far. #Italy navy ship to call in next few hrs. Survivors will move on to Italy for inquiry." Manu Moncada, Medecins Sans Frontieres' operations co-ordinator for migrations, tells BBC World News TV channel that more work needs to be done in the area to deal with the problem. He says: "This is a non-stopping issue. "We are really asking for scaling up of search and rescue operations in the Mediterranean Sea." Mr Moncada adds that MSF has repeatedly urged Italy and the EU as a whole to urgently step up efforts. says that 20 ships and three helicopters are involved in the ongoing search and rescue operation. Labour leader Ed Miliband says on Twitter: "Those dying in the Mediterranean are some of the poorest men, women and children in the world. We must act to stop these awful scenes." Deputy Prime Minister Nick Clegg says the EU should "review entirely the arrangements that are in place because we just cannot, on moral grounds, have such large numbers of people dying in such regular intervals in the Mediterranean." Meanwhile, UKIP leader Nigel Farage says the decision by Britain and France to bomb Libya had destabilised the country, leading to the refugee crisis. He adds: "I'm the one person who has said that I do think, especially for Christians in that part of the world, they now have almost nowhere to go." Elizabeth Collett, director of the Washington-based Migration Policy Institute think tank, tells BBC World News: "The EU is a machinery that is hard to get going." She adds that any proposals to change its border protection programmes would take time to implement. UK Foreign Secretary Philip Hammond says: "Stopping this needless suffering is a huge international challenge which demands a comprehensive, co-ordinated response. "We must target the traffickers who are responsible for so many people dying at sea and prevent their innocent victims from being tricked or forced into making these perilous journeys." He says he will discuss the way forward with EU foreign ministers in Luxembourg on Monday. says on Twitter the situation, as of 18:30 local time (17:30 UK), remains that 28 people have been rescued and 24 bodies recovered. The Archbishop of Canterbury, Justin Welby, has said all European and Mediterranean countries have to take responsibility for dealing with the problem. Speaking to BBC chief international correspondent Lyse Doucet, he said: "When people are drowning in the Mediterranean, the need, the misery that has driven them out of their own countries, is so extreme, so appalling, that Europe as a whole must rise up, and seek to do what is right. "It will be demanding, and that's why the burden must be spread across the continent, and not taken by just one country or one area." tweets: "I will meet @matteorenzi tomorrow in Rome to coordinate way forward." MarineTraffic - to give you some sense of the scale of the search and rescue operation under way. The Italian leader adds that Europe is facing a serious problem and has to do "everything it takes" to solve it, Mr Renzi adds. Mr Renzi says "these brothers and sisters of ours who have died in the Mediterranean Sea" cannot be saved simply by checking ships, "but by preventing them from leaving and being subject to this slave trade". Mr Renzi says it is not yet known how many lives have been lost in the latest disaster. He also stresses that Italy wants to call an EU meeting on the issue, describing it as a "scourge" in the continent and a "new slave trade". He sent condolences to the families of the victims and thanked those involved in the rescue effort. a news conference on the boat disaster. tweets: MEP @RobertaMetsola: "Two years after Lampedusa #migrant tragedy the Med remains a cemetery. EU has to act." 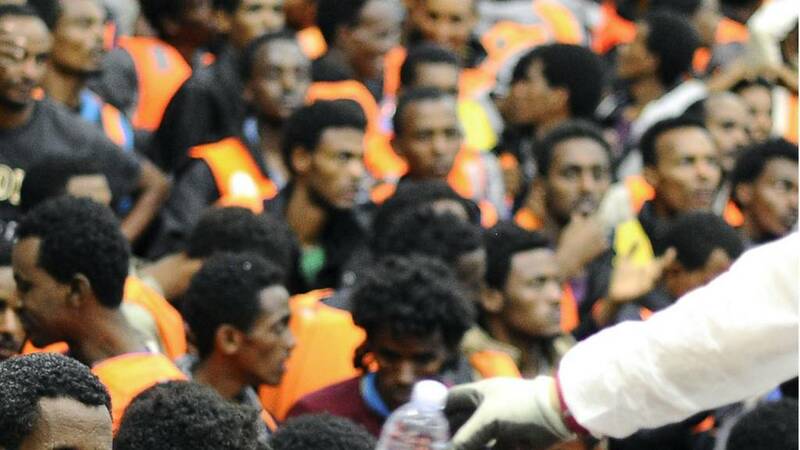 #malta #Italy #libya"
tweets: "Talked to PM Muscat after tragic deaths in Mediterranean. Will continue talks w/ EU leaders, Commission & EEAS on how to alleviate situation." explains the scale of the journey migrants from Africa and the Middle East face each year. The Economist asks why migrants crossing the Mediterranean are "dying this year at an unprecedented rate" - and what can be done. It says: "The European Union's response so far has been remarkably languid. The latest disaster may at last spur it into action." says: "A European Commission official confirmed to me that one idea which has been suggested as they draw up plans for a new comprehensive migration policy is to set up camps in North Africa where migrants can be assessed to see if they have a legitimate claim for asylum. "At the moment all this is done in EU countries after the migrants arrive from North Africa. "The official said several EU member states had suggested this but there had been no decision on it so far." the hunt for the people-trafficking gangs who are responsible for sending people across the Mediterranean - and often to their deaths. Italy's Ansa news agency reports that 22 of the survivors are now on board the Portuguese merchant ship King Jacob that was in the area when the boat capsized (See 15:34 entry). Another six survivors are on Italy's Gregoretti coastguard ship, a Navy vessel, and a merchant boat. tweets: "Hard to verify but if we add victims from last night to those who died since the start of 2015 - total is around 1,600." Laurens Jolles, UNHCR's representative for Southern Europe, tells APTN television that the current EU border patrol operation is insufficient. "The [Italian] coastguard with this small capacity that they have are doing whatever they can to rescue lives, going very very close to Libya, if necessary, and working non-stop day and night," he says. "But it is clear that they need help... there has to be something else put in place in the European context and that really needs to happen." says: "It is estimated 1,500 migrants have died already this year making the crossing from North Africa to the shores of Europe - most of them drowning over the past week. "The warmer weather is encouraging much larger numbers to take to the sea." tweets: "After accusations of complacency, the #EU Commission is rushing out press releases on the migrant tragedy in the #Mediterranean." This is an image taken earlier this week of the King Jacob Portuguese cargo vessel, the first ship to arrive near the migrant boat before it capsized. tweets (in Italian): "Right now, we don't need the populism of Beppe Grillo, Giorgia Meloni and Matteo Salvini, but the help of the EU." EU foreign policy chief Federica Mogherini says the EU must tackle such tragedies without delay. "We need to save human lives all together, as all together we need to protect our borders and to fight the trafficking of human beings. "Every single day, we have the duty to save human lives, sharing among all the 28 this duty and a responsibility that for too long has been left only to the southern countries." The leader of Italy's anti-immigrant Northern League party, Matteo Salvini, calls for a naval blockade of the coast of Libya. Mr Salvini writes on his Facebook page: "The friends of Mare Nostrum have blood on their hands... [We need] an immediate naval blockade of the Libyan coast!" These are the first images to be published of the search and rescue operation, and were released by Italy's coastguard service. Here is the latest information we have so far. At least 650 migrants are feared to have drowned after their boat capsized off the coast of Libya, with some reports saying about 50 people have been rescued. Federica Mogherini, EU foreign policy chief, said the spate of migrant boat sinkings was "unacceptable". She said: "We have said too many times 'never again'. Now is time for the European Union as such to tackle these tragedies without delay." Even though the search and rescue operation is taking place some 17 miles (27 kilometres) from Libya's coastline, Italy's coastguard is co-ordinating the efforts from its headquarters in Rome. Maltese and Italian ships, as well as merchant vessels, are also taking part in the search effort. More on the emergency meeting of ministers called by the European Union. The European Commission said foreign and interior ministers would be involved. A date is yet to be set for the meeting. It said in a statement: "The reality is stark and our actions must therefore be bold. These are human lives at stake, and the European Union as a whole has a moral and humanitarian obligation to act." tweets: "Just for the record today's #migrant tragedy will be the worst tragedy at sea since WWII. #NoMoreDeathInTheMed." The surveillance programme now in place is Triton - which operates with less than a third of Mare Nostrum's budget. It is run by the EU's border agency and has a remit to patrol only Italian and Maltese waters. It has helicopters, two aircraft and patrol boats available, and helped rescue 22,300 people between November 2014 and February 2015. But much of the criticism after today's tragedy has focused on the limited remit of Triton. Back in October 2013, after an earlier tragedy near Lampedusa, Italy's government launched Mare Nostrum - a programme with a 9.5m euro ($10.3m) monthly budget that monitored large parts of the Mediterranean. Equipped with a thousand-strong staff, drones and helicopters, Mare Nostrum helped save 113,000 people in a year and led to the arrest of 500 human traffickers. But Mare Nostrum is no more. tweets: "EU Ministers to meet over potentially the greatest tragedy which has happened in the Mediterranean in recent years. Proactive Malta." On a boat far from land, the seas are calm and the wind light in the waters south of the tiny island of Lampedusa. It is in these calm conditions that traffickers in Libya launch the migrant boats. These are the deadliest waters in the world where thousands are dying. As our boat rises and falls gently on the waves, what strikes you is the vastness of the water. It may look a short stretch of sea on a map. But the gap between the coast of Libya and a new life in Europe is an enormous dangerous empty stretch of water with nothing from horizon to horizon. Italy's Prime Minister, Matteo Renzi, has travelled back to Rome from the central Italian town of Mantua, where his party was launching its election campaign, to follow the latest developments. He has reportedly called a special cabinet meeting for 16:00 local time. Richard Galpin, BBC World Affairs correspondent, says the European Commission is "ready to provide emergency funds to Italy if Rome asks". An EC official says if Italy makes a formal request for emergency funding to help with the issue of migration, then this could be provided immediately, but so far Brussels has not received any such request. A request for more comprehensive assistance would require discussions with EU member states, the official says. Malta's Prime Minister Joseph Muscat says history will judge European nations harshly if efforts are not made to stop migrant crossing deaths in the Mediterranean. "Although we are seeing encouraging signs from European politicians, action must be taken," he says. "There is a tragedy going on in the Mediterranean. A time will come when Europe will be judged harshly for its inaction as it was judged when it had turned a blind eye to genocide." Mark Micallef, chief reporter for The Times of Malta, believes the current rescue operation is "exactly what people forecasted" when the EU replaced migrant rescue operation Mare Nostrum with the Triton operation in 2014. He says Mare Nostrum operated "very close to Libyan borders" which enabled rescuers to be "right there on the spot" in a mayday situation. However, people had "anticipated" that Triton's new area of operation was "not where SOS' tend to happen" so rescue vessels are reaching scenes "too late", he adds. confirms on Twitter that 28 people have been rescued and 24 bodies have so far been recovered. To give you some sense of the scale of the search under way - here's an image showing the boats and ships searching for survivors. Towards the right hand side there is a cluster of vessels - among them are a Portuguese-registered cargo ship, a vehicle carrier from Malta and another cargo ship registered in Singapore. Mark Micallef, a journalist with the Times of Malta newspaper, tells the BBC the number of those rescued now appeared to be as high as 50. We're waiting for further confirmation of those numbers. BBC News looks at some of the reasons why migrant crossings in the Mediterranean are so deadly - and what is driving people to take the risk. The BBC's Imelda Flattery has tweeted an image of the port of Catania in Sicily, saying that many of those who drowned will arrive there later. "The pain of so many men"
The Italian prime minister, Matteo Renzi, says the number of dead in the migrant boat sinking, which currently stands at 28, were provisional "but destined to grow". He added: "How can there be beauty while every day in the Mediterranean Sea we witness a massacre, the pain of so many men and women that we pretend to forget?" Roberta Metsola, a Member of the European Parliament from Malta, tells the BBC: "This has been going on for too long. It cannot be that every year, as soon as the seas get calmer, we hear of hundreds more deaths." She called on greater co-operation and surveillance by European countries. "The only way to truly change the reality is to address the situation at its roots," the European Commission says. "For as long as there is war and hardship in our neighbourhood near and far, people will continue to seek a safe haven on European shores. And as long as countries of origin and transit do not take action to prevent these desperate trips, people will continue to put their lives at risk." The European Commission says it is currently consulting with member states, European agencies and international organisations to prepare a new European Migration Strategy, to be adopted by the Commission in mid-May. "What we need is immediate actions to prevent further loss of life as well as a comprehensive approach to managing migration better in all its aspects," it says. In a statement, the European Commission says it is "deeply chagrined by the tragic developments in the Mediterranean today, but also over the past days and weeks". "The reality is stark and our actions must therefore be bold. These are human lives at stake, and the European Union as a whole has a moral and humanitarian obligation to act." This is a map of the routes taken by those looking to leave Africa behind and head into Europe. Charities have been quick to respond to the tragedy. John Dalhuisen, Amnesty International's director for Europe and Central Asia, says: "What we are witnessing in the Mediterranean is a man-made tragedy of appalling proportions. These latest deaths at sea come as a shock, but not a surprise. "Whilst merchant vessels and their crews have bravely attempted to fill the gap left by the chronic shortfall in specialist search and rescue teams, they are not designed, equipped or trained for maritime rescue. It is time for European governments to face their responsibilities and urgently set up a multi-country concerted humanitarian operation to save lives at sea." says in the Times of Malta that the island, a destination for many migrants crossing the Mediterranean, cannot look at migration as a "bogeyman". "There are no easy solutions to migration. It's no longer just about war. In today's world people are on the move, just like our own children are going abroad to better themselves. "If it were us - if we had to leave home for a chance at life with human dignity - wouldn't we take that chance?" This is the holding centre where migrants are taken to on the island of Lampedusa. Hundreds of migrants have drowned this month trying to reach Europe, even before this latest sinking. Comandante Filippo Marini of the Italian coast guard has told the BBC that rescue operations are still ongoing, with 28 survivors rescued so far. Some of them are now on a merchant ship and others are on a coastguard ship. There have been 24 bodies rescued from the sea so far, which are on the Gregoretti coastguard vessel. It is not yet known where the bodies and survivors will be taken. Mr Hollande also said there was an urgent need to increase the amount of patrol boats and of aerial surveillance flights. In an interview on the Canal+ channel, he said: "Those who put people on boats are traffickers, even terrorists." France's President Francois Hollande has called for an emergency meeting of European interior and foreign ministers to address the situation with migrants. It is a call that has been repeated in Malta, which is taking part in the search and rescue operation. "Thank God I am alive"
One migrant who had arrived earlier on Lampedusa told the BBC team there that he was glad to have made the trip. "I thank God I am alive," he told us. "Africa now is not good. In Nigeria we are bring threatened by Boko Haram. That is why I risked it." explains why the European Union is struggling to cope with the tide of migrants attempting to reach Europe from North Africa. and also helped rescue 480 other migrants from the sea earlier in the week. The BBC's Richard Bilton in Lampedusa says the Italian island is scrambling to react to the latest horror in the seas off its coastline. Much of the harbour has emptied and coastguard, customs and fishing boats all left before dawn to help with the rescue. It's still not clear whether the survivors will be brought back to Lampedusa. Staff at the small island hospital say they have not been told, our correspondent adds. here. About a dozen boats or ships have been circling an area north-east of the Libyan capital, Tripoli, for the last few hours. Amnesty International UK director Kate Allen says: "Yet again we have woken up to reports of another tragedy in the Mediterranean, which could bring the total number of migrants who've drowned just this year to a shocking 1,500. "This is a Europe-wide crisis that needs a Europe-wide response." Pope Francis went on to say: "Faced with such a tragedy, I express my most heartfelt pain and promise to remember the victims and their families in prayer." Speaking in St Peter's Square in the Vatican this morning, Pope Francis called on authorities to take action to avoid similar tragedies in the future. He said: "They are men and women like us, our brothers seeking a better life, starving, persecuted, wounded, exploited, victims of war. They were looking for a better life." The Italian coastguard says a major rescue operation is under way after the vessel carrying "between 500 and 700 migrants" capsized at midnight local time, in Libyan waters south of the Italian island of Lampedusa. Welcome to our live coverage of the rescue operation to help survivors of a boat carrying migrants which has capsized in the Mediterranean. Hundreds are feared to have drowned.